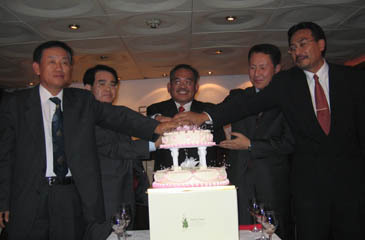 Abdul Mutalib Awang (second from right), director of the Malaysia Tourism Promotion Board (MTPB), Abdul Manaf Harun (second from left), newly arrived Korea regional manager of the Malaysian Airlines, Kim Jong-Uk (left), vice chairman of the Korea Tourism Association, and Hong Ki-Chung, vice president of Mode Tour pose for camera during the party. 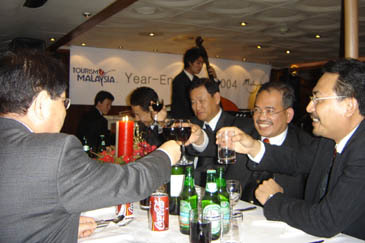 The Malaysia Tourism Promotion Board (MTPB) Seoul hosted a year-end party Dec 15, 2004 in a rare way — on a cruise boat in the middle of the Han River. Nearly 100 guests including Korean travel agents, journalists from related news media, Malaysian tourism officials, and other expatriates enjoyed the friendly get-together held on a Han River cruise boat in the evening. 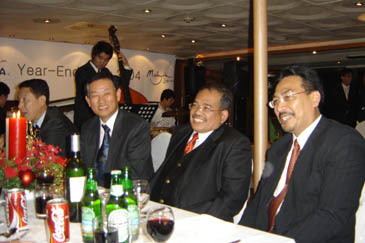 On hand at the dinner party were Abdul Mutalib Awang, director of the Malaysia Tourism Promotion Board, Abdul Manaf Harun, newly arrived Korea regional manager of the Malaysian Airlines, Kim Jong-Uk, vice chairman of the Korea Tourism Association, and Hong Ki-Chung, vice president of Mode Tour. During the buffet dinner MTPB Director Awang explained in details what his country is doing to make Malaysia a perfect leisure destination for South Korean people. 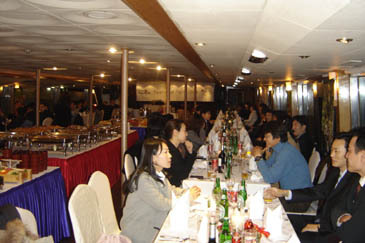 The year-end dinner party held by MTPB on a cruise boat in the Han River Dec. 15, 2004. Mr. Awang observed that tourist arrivals from South Korea this year is most likely to top 90,000, which he said is a "turning point" figure from an average of 50,000 registered over the last five years. "Malaysia will embark on a large-scale promotion of its five major destinations including Kuala Lumpur, Penang, and Langkawi as leisure destinations for Korean family tour groups, honeymooners and eco-tourists next year to attract at least 120,000 South Korean tourist arrivals." 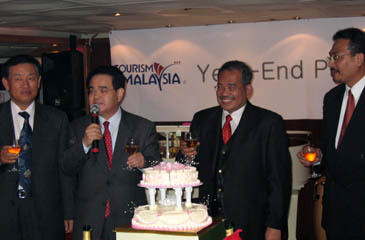 Malaysia's top tourism official in Seoul said. 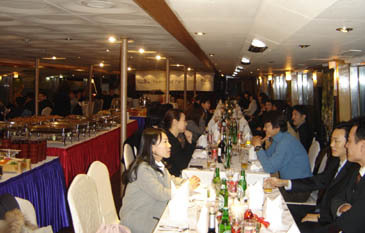 During the gathering a variety of tasty dishes and music were offered to the enjoyment of the guests who braved chilly rainfalls to join the year-end dinner party on a pleasure boat which left Yoido quay at 6 p.m. for a two-hour cruise on the Han River. 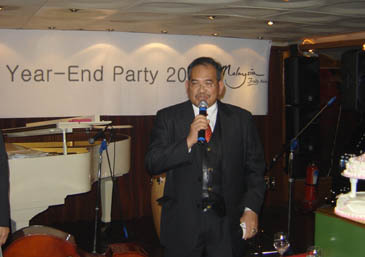 Abdul Mutalib Awang, director of the Malaysia Tourism Promotion Board, speaks at the year-end party he threw on a cruise boat in the Han River Dec. 15, 2004. The occasion was especially valuable as they served one of Malaysia's traditional cuisines — Sate — which is not easy to come by at a Korean restaurant in Seoul. Pop music by a group of local jazz musicians added flavor to the year-end party on a pleasure boat in the center of Korea's largest river. 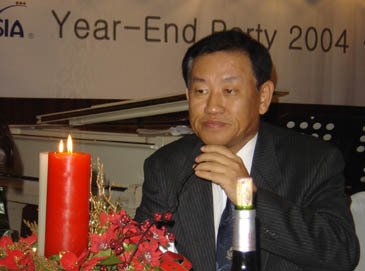 The unique year-end party thrown by MTPB Seoul Director Abdul Mutalib Awang was clearly impressive enough to attract a growing number of Korean travelers into the tropical Southeast Asian country. Director Awang's warm and sincere manner, informative and witty conversations were also more than enough for the Korean guests to get a taste of what the tour to one of the world's most fascinating tourist destinations would be like. 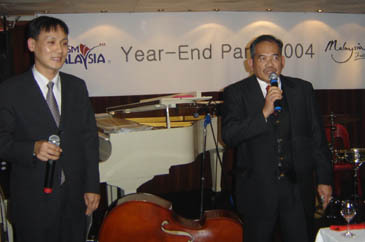 Mr. Jay Joo (left) of the Malaysia Tourism Promotion Board (MTPB) and MTPB Director Abdul Mutalib Awang officiate year-end dinner on a Han River boat.